It seems Samsung just can’t catch a break. 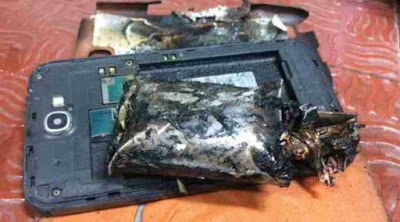 In recent news, several Galaxy Note 7 has been the subject of headlines and a wave of criticisms due to issues that arose from battery explosions. After then, news of a Galaxy S7 edge catching fire puts the company into more trouble. Now, a new report indicates that the next Samsung handset to catch fire is a Galaxy Note 2, a four year old device from the South Korean tech giant. Based on the report, a Galaxy Note 2 had caught fire and began to smoke during a plane flight on IndiGo with a passenger-filled cabin. This had made the Directorate General of Civil Aviation of India to announce an advisory to turn off their Samsung Galaxy Note handsets for safety precautions and fears of another incident of a smartphone catching fire. However, it’s important to note that the Galaxy Note 2 is already a four year old unit, so a product of its age would probably already have several unnoticed issues that caused it to burn. It could also be a case of a fake or third party battery. Whatever the case, this is just the last thing Samsung needs given that the company is already hard at work to fix issues regarding its latest flagship phablet.